The amazingly powerful skill of being simple. Do you think it sounds strange to say being simple is a powerful skill? In case you do, think about this. You can see our daily lives have become more and more complicated. So, when we encounter something that very simply and effectively touches us, it's such a refreshing surprise. 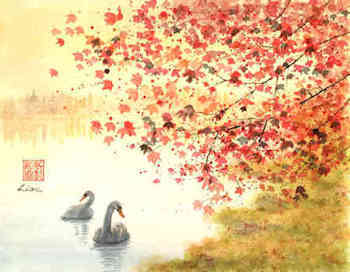 Like this painting by subscriber Alice Liou. This is why being simple is such a powerful skill. It is so much easier and often more natural to be complex. For me, being simple was years in the learning. It took that long, because it went against my natural tendency to be detailed. In one of the first watercolor paintings I ever did, I used a couple hundred little strokes of paint to show tall grass. I cringe at the thought of doing that today. And beginning to imagine how what you see could be different. Now I know from experience that it's hard to imagine away details. That’s why it often helps to create a sketch – something you can actually see – to gradually simplify an idea. But, I've had people tell me they are only interested in doing landscapes. The implicit message being that you don't need to know how to draw to paint landscapes. I suppose that could be true if you never put boats, buildings, people or animals in them. But it's often these things that add flavor to a landscape. So, for you landscape folks let me introduce this photograph. And see if I can show you why drawing is essential for developing the powerful skill of being simple. And developing more of your imagination. Imagine you are on safari in Kenya. 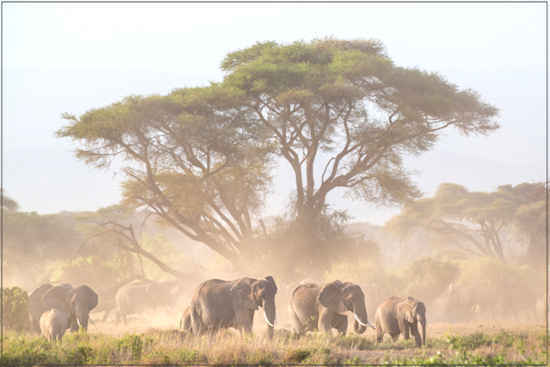 One bright sunny morning during breakfast you hear the trumpeting of elephants. Instantly alert, head swiveling excitedly, you search for the herd. In your mounting excitement breakfast is completely forgotten. Heart pounding, you dash madly to your tent. Throwing open the flaps, you frantically search for your camera, catapulting bedclothes left and right. With a shriek you find it and sprint to the edge of the clearing, shooting pictures as fast as your finger can press the shutter. Now you have these great photographs, like the one above, and you want to create art of them. But what story do you tell in your art? Is it a story that focuses on the large tree that dominates the photograph? Or is it a story where the elephants are the stars? Or something else? That's where sketches come in. They help you choose the best story. P.S. Which excites you more? When someone tells you a story in a calm matter-of-fact voice. Or when someone tells that story with emotion and excitement in his voice? Well, sketching is the start of finding the best way to put emotion and excitement in your story. 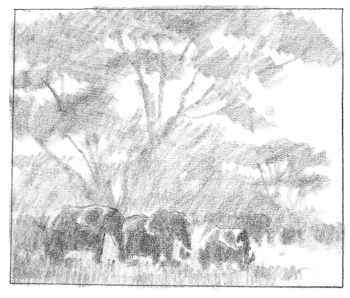 And this sketch is only one way of telling the story of your African adventure. Is helped or hindered by how you use Story-telling Art Secret #5 You Absolutely Need to Know.